A rendering of Northrop Grumman's Omega rocket at Kennedy Space Center's pad 39B. COLORADO SPRINGS – As Northrop Grumman's upcoming Omega rocket progresses toward a 2021 debut flight, company officials here on Monday said it's time to "start cutting metal" at Kennedy Space Center in preparation for the new launch system. The solid rocket fuel-powered vehicle, which recently secured nearly $800 million in support from the Air Force, will use former space shuttle architecture at KSC like an unused mobile launcher platform. Northrop Grumman will also take advantage of the Vehicle Assembly Building, a crawler-transporter, and pad 39B – all of which will also support NASA's upcoming Space Launch System. The company expects work at KSC to begin this month, which keeps it on track for a 2021 liftoff. "The first thing you're going to see is mobile launch platform number three roll out to the west park site," Mike Laidley, a vice president with Northrop Grumman, told FLORIDA TODAY during the 35th Space Symposium here. "We're going to buy a big Omega banner and hang it off the side of the mobile launch platform." "It's time to start cutting metal," he said. Sharing a pad with NASA means teams will have to configure Omega's rollout through a series of steps that will also be necessary for SLS. The hardware changes at KSC will be significant. 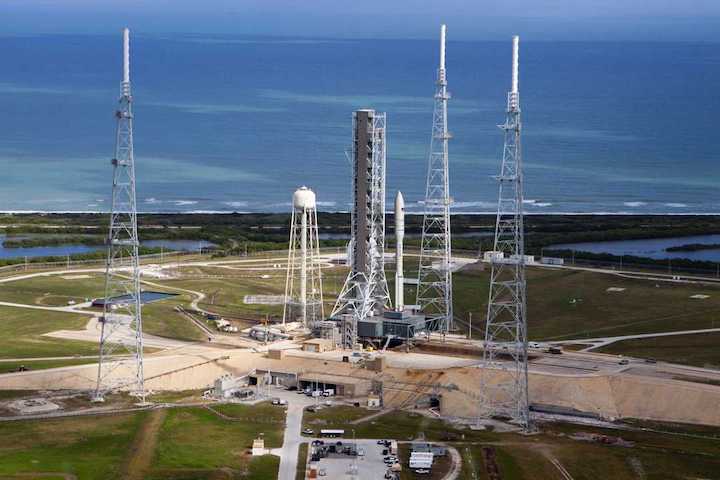 • The rocket will use the Vehicle Assembly Building for vertical stacking and other preparations, which will require dedicated tooling and systems. • Before Omega can roll out to pad 39B for launch, it will need support from a mobile launch tower as the pad itself doesn't have one – it's what NASA refers to as a "clean pad concept." Northrop Grumman will have to build one, likely at great effort and expense as it will have to be taller than the rocket itself, which clocks in at nearly 200 feet. • From there, a NASA crawler-transporter will pick up the stacked rocket and mobile launch tower and transport them to pad 39B for launch a few days later. This is a departure from space shuttle missions, which used an unmovable launch tower and sometimes sat on the pad for weeks. The short times on the pad will be critical as SLS and Omega will have to share it. Previously known as the Next-Generation Launch System, or NGL, before Northrop Grumman completed the acquisition of Orbital ATK in 2018, Omega is being developed primarily for national security missions such as military communications satellites and the Global Positioning System constellation. "This rocket was not designed to go to Mars, it was not designed to go to the moon," said Kent Rominger, a former space shuttle astronaut and current Northrop Grumman vice president. "We're committed to national security." But considering NASA's recent charge toward a moon mission by 2024, Rominger noted that while Omega wasn't necessarily designed for deep-space missions, it is capable of taking payloads to lunar orbit if necessary. "This system can put 20,000 pounds into a translunar orbit, so it's very capable," he said. Omega is a primarily solid fuel-powered rocket. Others, such as SpaceX's Falcon 9 and United Launch Alliance's Atlas V, are liquid-fueled, though the latter sometimes uses Northrop-built side-strapped solid rocket motors. Solid rockets are notable for being unable to shut down after being fired, whereas liquid-fueled engines can be throttled and turned off if necessary. Northrop Grumman said its solid engines are also more efficient than liquid-based alternatives. Omega joins what is essentially a fleet of other rockets targeting 2021 liftoffs from the Eastern Range. Those include Blue Origin's New Glenn rocket and ULA's Vulcan Centaur, both of which will launch from Cape Canaveral Air Force Station.